Gary Hammond forwarded this weekend's Mystery Foto of Long Island roadside signs. What is the exact year that this photo was taken? October 1930 as indicated by the films on the Patchogue Theater billboard. Call of the Flesh was shown at the theater on October 14-15, 1930 and Let's Go Native was shown on October 16-18, 1930. What was the likely location of these roadside signs? Near Lake Ronkonkoma (see possible specific location options in the Comments section). Where was the Motor Parkway sign pointing to? The Eastern Terminus of the Long Island Motor Parkway and the Ronkonkoma Lodge. Provide details on any of the advertisers. Congrats to Robert Greenhaus, Greg O., Tim Ivers, Steve Lucas, and Art Kleiner (see below Kleiner's Korner) for correctly identifying the year and location of the roadside signs. Special kudos to Tim Ivers, Greg O. and Greenhaus for discovering the two 1930 movies being shown at the Patchogue Theater. 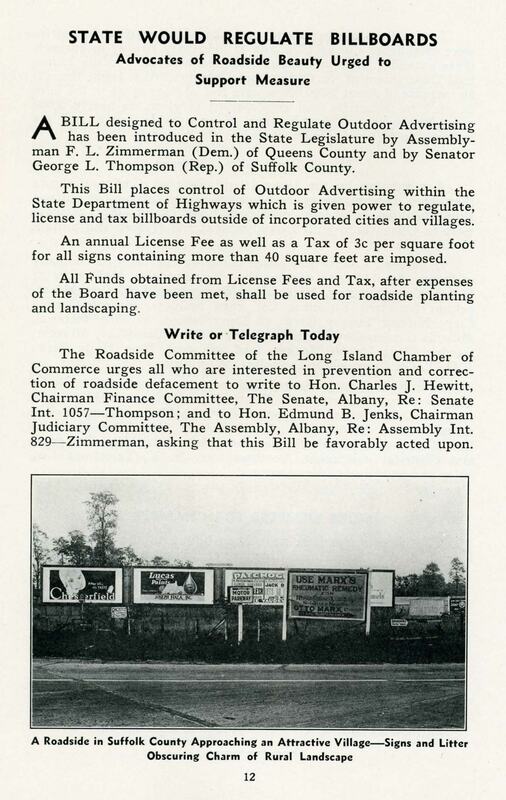 Gary Hammond: "The Long Island Chamber of Commerce was running a big campaign to clean up the roads c. 1930/31 and get rid of unsightly billboards and signs - and did a really good job doing it! This photo with the article caught my eye - look at the center sign!!!" The Motor Parkway sign pointed to the direction of the Eastern Terminus and the Ronkonkoma Lodge located in Lake Ronkonkoma. 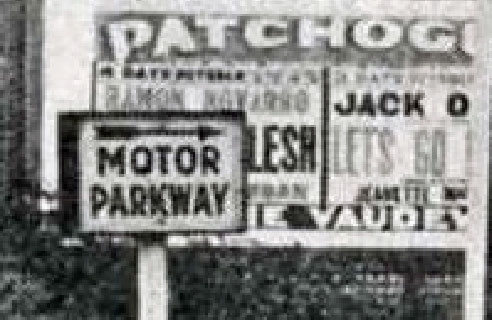 The billboard behind the sign promoted the two feature films running at the Patchogue Theater in the fall of 1930: Call of the Flesh starring Ramon Novarro and The Last Native starring Jack Oakie. 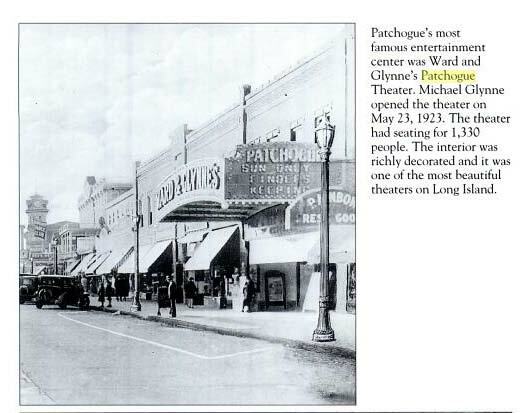 For more than 80 years, the Village of Patchogue has had a stage at the center of our community, the Patchogue Theatre that originally opened in 1923 as Ward & Glynne’s Theater. In its day, the theatre attracted first run feature films, Broadway productions, vaudeville and the best in burlesque. silent films and performances by John Philip Sousa and acts such as The Rose Royal Midgets could also be enjoyed there. All this for the admission price of 40 cents for adults, half price for children. Glynne operated the theater until the Great Depression, when it was purchased by Prudential Playhouses, Inc. The days of vaudeville had come to a close, but changing updated film and sound equipment maintained the theater as a major venue for first-run films, as well as a community center for bingo, sing-alongs and other activities. After a fire hit the theater lobby in 1958, the theater was redecorated and designed in a simple and austere manner, with much of the ornate decor simply covered up behind plywood, drywall and wallpaper. The Patchogue Theatre continued to operate solely as a movie house, and in 1982 the ground floor was divided into two theaters, adding a ceiling to extend the balcony level for a third screen. The theater continued to operate as a triplex until 1987 when, through a combination of the recession that hit Long Island at the time and the opening of a 12 screen theater nearby, the building was closed. It stood empty for eight years, and an investigation of the building by village officials and business leaders in October 1994 found that much of the original decor has been preserved under the drywalls, wallpaper and plywood installed in the late 1950s. In 1997 several local businessmen came up with the initial funds to purchase the theatre and the Village of Patchogue applied for grants to renovate and restore the building to its former glory. The theatre interior was restored to its 1923 grandeur in several phases as the theatre was open for business and the first performance was held in December 1998. There are now 944 orchestra seats and 222 balcony seats; a total of 1166, plus two sections for disabled seating. Robert Greenhaus has forwarded this image showing that the two 1930 movies shown at the Patchogue Theater supplemented a vaudeville show. 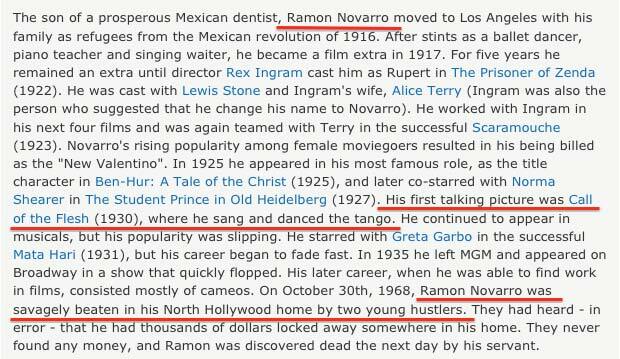 The son of a prosperous Mexican dentist, Ramon Novarro moved to Los Angeles with his family as refugees from the Mexican revolution of 1916. After stints as a ballet dancer, piano teacher and singing waiter, he became a film extra in 1917. For five years he remained an extra until director Rex Ingram cast him as Rupert in The Prisoner of Zenda (1922). He was cast with Lewis Stone and Ingram's wife, Alice Terry (Ingram was also the person who suggested that he change his name to Novarro). He worked with Ingram in his next four films and was again teamed with Terry in the successful Scaramouche (1923). 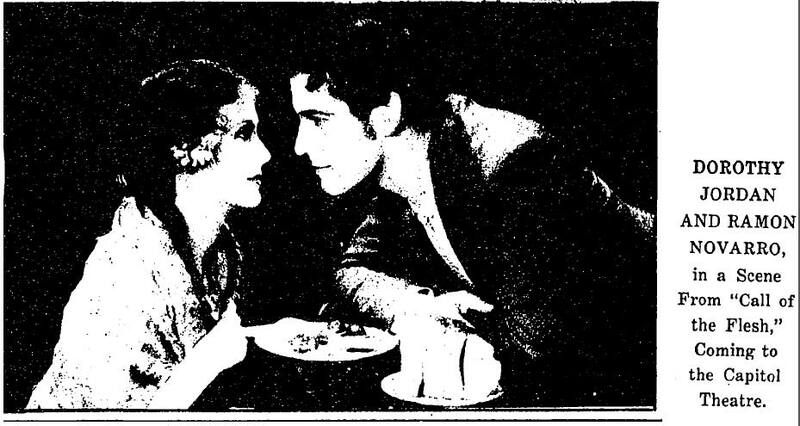 Novarro's rising popularity among female moviegoers resulted in his being billed as the "New Valentino". In 1925 he appeared in his most famous role, as the title character in Ben-Hur: A Tale of the Christ (1925), and later co-starred with Norma Shearer in The Student Prince in Old Heidelberg (1927). His first talking picture was Call of the Flesh (1930), where he sang and danced the tango. He continued to appear in musicals, but his popularity was slipping. He starred with Greta Garbo in the successful Mata Hari (1931), but his career began to fade fast. In 1935 he left MGM and appeared on Broadway in a show that quickly flopped. His later career, when he was able to find work in films, consisted mostly of cameos. On October 30th, 1968, Ramon Novarro was savagely beaten in his North Hollywood home by two young hustlers. They had heard - in error - that he had thousands of dollars locked away somewhere in his home. They never found any money, and Ramon was discovered dead the next day by his servant. YouTube Call of the Flesh: "Ramon Novarro would have very much liked to be opera singer but his voice was too light for it and excellent for song and operetta. 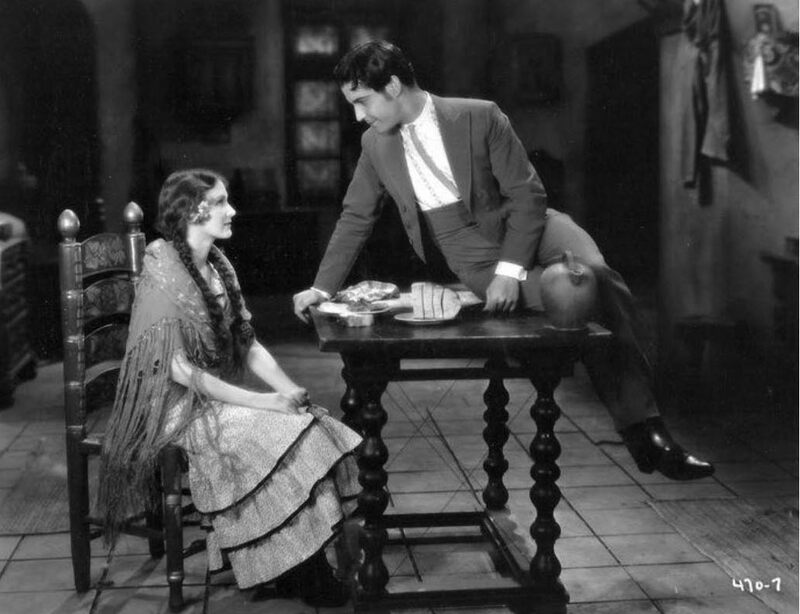 In that movie, Call of the Flesh (1930) he plays Juan, a singer, and his performance of the Massenet's opera Manon becomes more dramatic and successful because he believes have lost forever the woman he loves. From point of view of a professional singer, his interpretation is perhaps not absolutly good because he forces his voice but he was not an opera singer and however that moment of the movie is very beautiful and emotional. Call of the Flesh is one of the very charming roles of Ramon Novarro, probably the best and the most natural and sensible actor of the 20's and 30's in Holywood." Jack Oakie was born on November 12, 1903 in Sedalia, Missouri, USA as Lewis Delaney Offield. He was an actor, known for The Great Dictator (1940), Lover Come Back (1961) and It Happened Tomorrow (1944). He was married to Victoria Horne and Venita Varden. He died on January 23, 1978 in Los Angeles, California, USA. 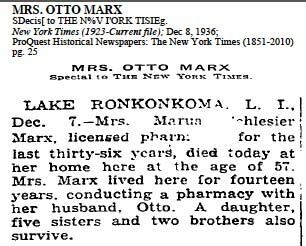 Otto Marx's pharmacy was located in Lake Ronkonkoma. 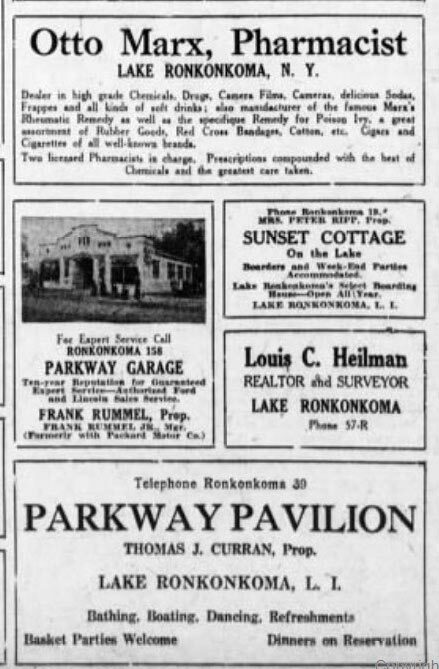 As seen in this 1926 Brooklyn Eagle "Beautiful Ronkonkoma" page, Otto Marx advertised his pharmacy along with the Parkway Pavilion (the Petit Trianon? )and the Parkway Garage. Joseph Faila's paint store was located on Railroad Avenue in Sayville. This 1930 billboard promoted Chesterfield cigarettes with a "After all-it's taste" theme. It reportedly sparked a surge of sales tin this type of woman's hat. The billboard was created by Otis Shepard using a portrait of his wife Dorothy. 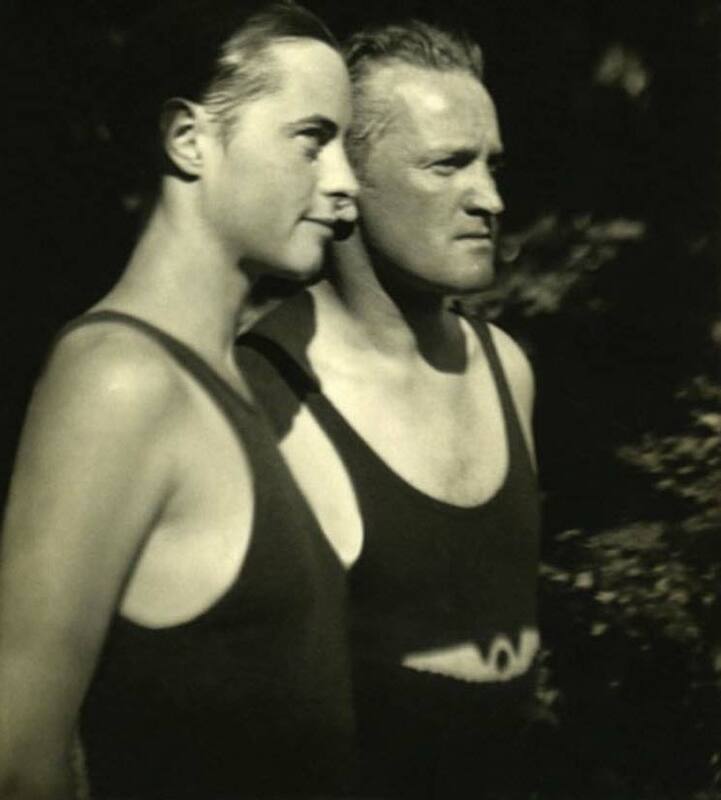 Dorothy (left) and Otis Shepard in 1926 before they got married. • Ronkonkoma, probably on or near Rosevale Avenue. • The Ronkonkoma Lodge entrance to the Long Island Motor Parkway. • Chesterfield is a brand of cigarettes, popular during the 1920’s and ‘30’s, originally manufactured by The Liggett & Myers Tobacco Company and named for Chesterfield County, Virginia. The brand is still made today by the Altria Group. • Joseph Fiala moved to Lake Ronkonkoma with his family in 1913 and opened Joseph Fiala, Inc., a retail paint and wallpaper store at 199 Railroad Avenue in March 1928. • Pharmacist Otto Marx was an American born in 1874 in Rottwell, Germany, where his father was stationed as American consul. 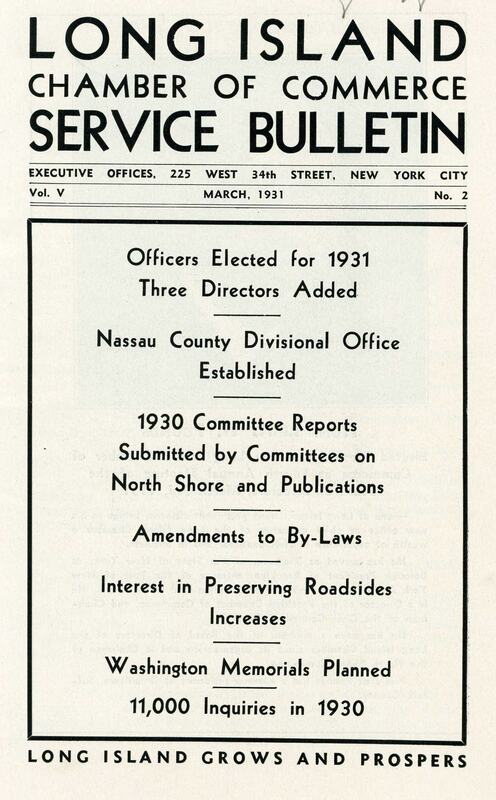 Mr. Marx owned and operated a pharmacy on Hawkins Avenue, Lake Ronkonkoma between 1922 and 1946. • The Patchogue Theater was located at 71 E. Main Street, Patchogue, now the Patchogue Theater for the Performing Arts. 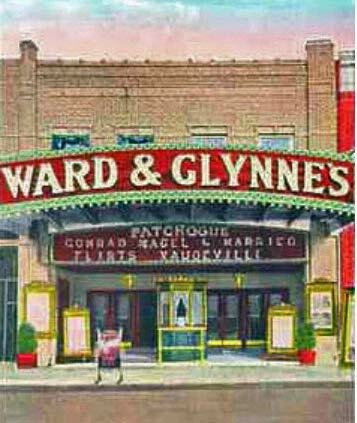 The theater was built as Ward and Glynne’s Theater in 1923. 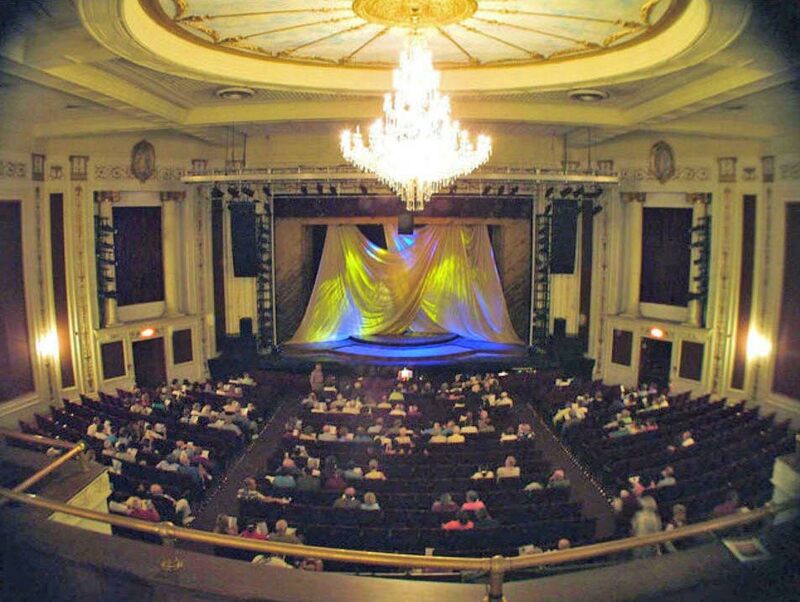 The theater was acquired by the Prudential Theater Circuit in 1929. 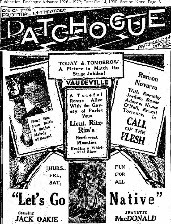 According to an ad in the October 14, 1930 edition of the Patchogue Advance newspaper, “Call of the Flesh,” staring Ramon Novarro was shown at the theater on Tuesday and Wednesday, October 14th and 15th, 1930; and “Let’s Go Native” starring Jack Oakie was shown between Thursday, Friday and Saturday, October 16th,17th and 18th, 1930. In, or near, Lake Ronkonkoma. Probably towards the Ronkonkoma Lodge entrance. 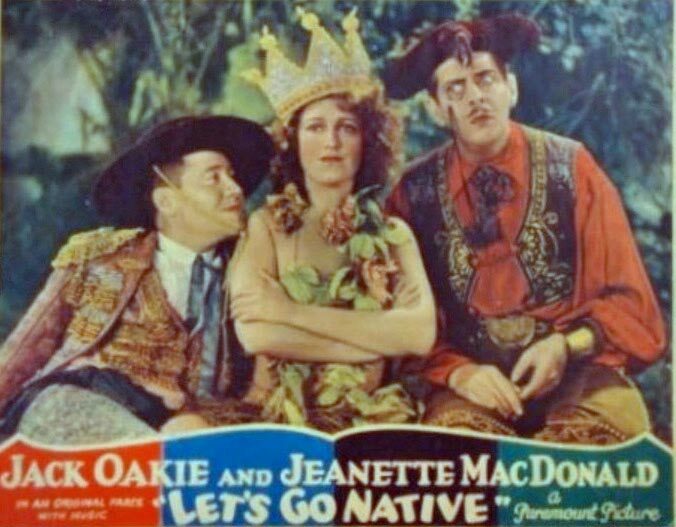 Also uncovered the second movie playing at the Patchogue Theater as ’ Let’s Go Native’ starring Jack Oakie, also from 1930. 1st closeup shows things going on in Patchoque 2am on May, I think 1980, May be live Vaudville..2nd closeup, I can’t make out what it says, but it’s in Ronkonkoma 2 miles away. 3&4 close ups ? Motor Parkway sign is pointing, that you can get to those places on Motor Parkway, I wish the signs were clearer, I could do better than this. The signs are on a road going north and south. I’m going to try to do some research on these signs and get back to you. My best guess for the location would be in Sayville at Montauk Highway and present day Lakeland Avenue (If you are westbound). Lakeland turns into Ocean Avenue, leading to Lake Ronkonkoma and the LIMP terminus. The arrow is pointing to the right (northbound). The billboard behind the LIMP sign shows the Patchogue movie theater advertising a Ramon Novarro movie “Call of the Flesh” and a Jack Oakie film, which played there in 1930. 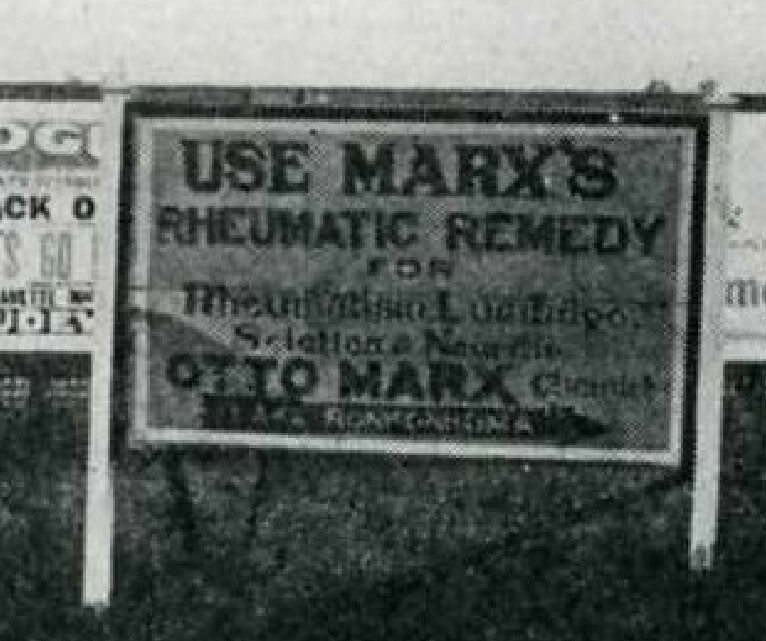 The next sign, “Otto Marx Rheumatoid Remedy” advertised for Marx’s Pharmacy, located in Lake Ronkonkoma. 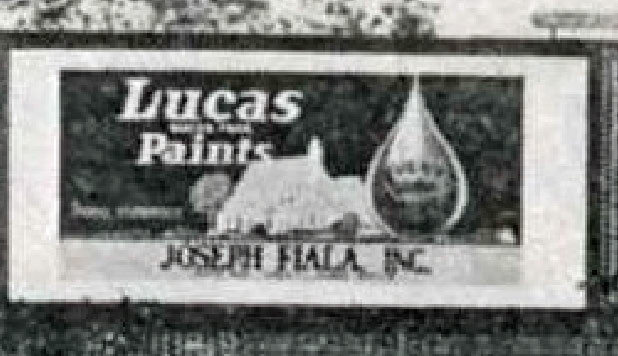 Joseph Hala had a paint store in Sayville and featured Lucas Paints. The last sign advertised Chesterfield cigarettes. I’m thinking maybe these advertisement signs would’ve been posted on the E/S of Rosevale Ave, Lake Ronkonkoma, somewhere between present day Portion Rd and the present day interesection of the LIMP/Rosevale Ave. Figuring the Motor Pkwy sign is arrowing south towards the LIMP, and Patchogue is basically south of where I’m figuring this location is.The time period , I don’t know Chesterfield cigarettes are’nt as popular now? I took a look on wikipedia. prob.Commack Rd.,south of Motor parkway. Sign is pointing north and the sign for the Patchogue Vaudeville puts it around ‘22 to 24. Also the style of the Chesterfield sign. 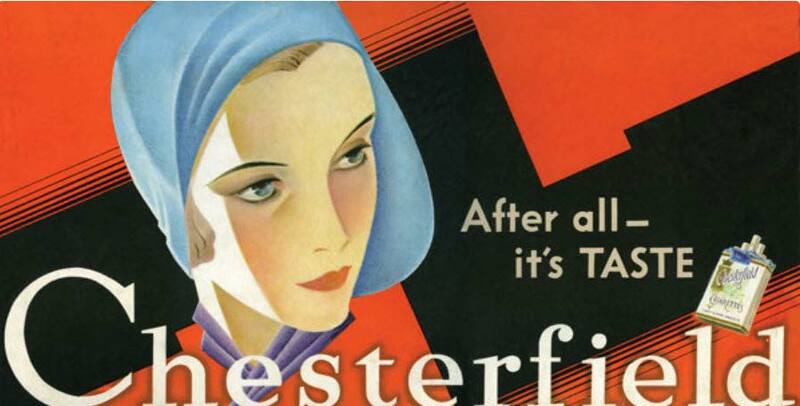 I suppose everyone knows Chesterfield was a cigarette brand—targeted at women. The other signs are unknown to me. The photo was taken in 1930, probably in November because that’s when Ramon Novarro’s latest film “Call of the Flesh” (released on 8/16/30) was being shown at various theatres in Suffolk County including the Patchogue Theatre which had been built only five years earlier. Joseph Fiala had a paint store at 199 Railroad Avenue in Sayville at the time and also did home redecorating. Otto Marx ran a pharmacy on Hawkins Avenue in Ronkonkoma for many years. Chesterfield and Camels (partially hidden on right) were two of the “big three” cigarette brands (along with Lucky Strike). With regard to possible locations of the photo, the only road that makes sense is what was called at the time “the road to Ronkonkoma”. Today we know it as (going north from Sayville) Railroad Avenue, Lakeland Avenue, Ocean Avenue, and Rosevale Avenue where we find the beginning (or end) of the Long Island Motor Parkway. But exactly where on this road? At the intersection of Veterans Highway or Sunrise Highway? NO, neither had been built yet. I’m guessing the northwest corner of Lakeland Avenue and Church Street in Bohemia since Church Street was a well used road even then and was a main route from there to Patchogue. I also wouldn’t be surprised to see these billboards along Lakeland Avenue closer to the Sayville LIRR station. What is the exact year that this photo was taken? 1930 - movie playing at the Patchogue theater (“Call of the Flesh) opened in Fall, 1930. 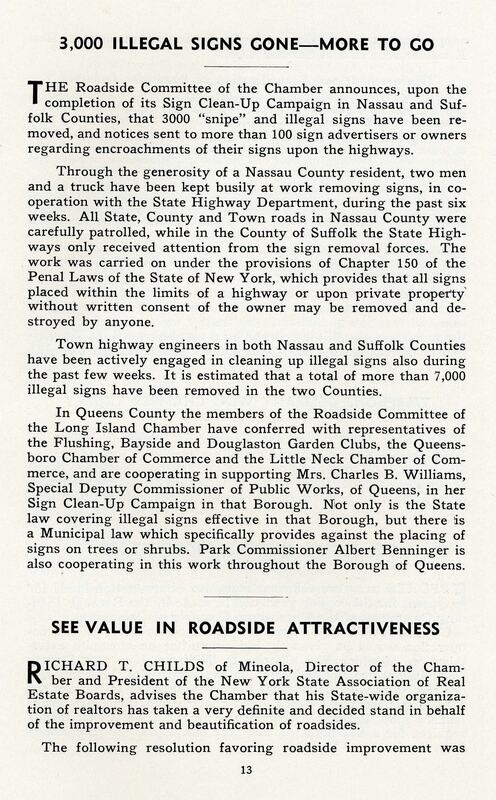 Since the advertisers were on the south shore, perhaps Sunrise Highway (Sunrise Trail). Where was the Motor Parkway sign pointing to? North to Ronkonkoma Lodge or Petite Trianon. Provide details on any of the advertisers. Howard - see more in the material I send you in Kleiner’s Korner under separate cover. Lucas Paint/Joseph Fiala’s Paint Store located at 199 Railroad Avenue in Sayville. Otto Marx - Chemist/Pharmacist - Came to Lake Ronkonkoma in 1922 and served the area until 1956. Located on Hawkins Avenue. Patchogue Theatre - sign advertises the movie “Call of the Flesh”, starring Ramon Novarro in his first talking movie, opened in 1930. 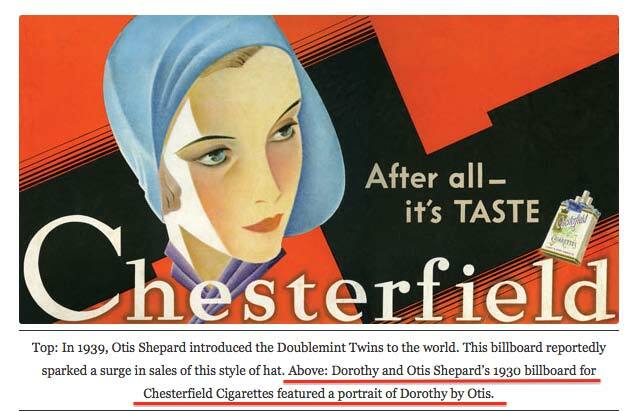 “Chesterfield cigarettes – After all….. it’s TASTE”. lol! “Patchogue, Mr. Bath Petsble?, Ramon Novarro, Jack O Lantern?, Let’s Go Mets?, Jeanette ……. ?, …..Vaudeville? The signs appear situated at a busy T intersection (solid yellow line in the center) en route towards Lake Ronkonkoma and Patchogue. The only T intersection I was able to find that faced in the correction direction was in Lake Ronkonkoma at Central Islip Blvd and Rosevale Ave, facing East at the Lake (possibly behind those signs), one block NW of the LIMP. Wild guessing, it’s close to mid ‘30’s with asphalt pavement on the road. Is that the lake behind the Camels’ sign on the right? Veery Sneeaky! 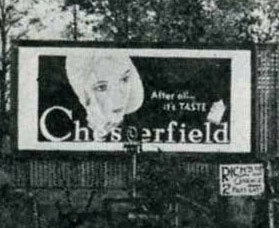 Adding this piece of evidence to my date of 1930 - the Chesterfield billboard was used in 1930 and developed by the husband and wife team of Otis and Dorothy Shepard (that’s Dorothy’s portrait in the billboard). The team also created the Wrigley’s Doublemint twins ad campaign in 1939. Howard - see additional documentation being sent. Never got a chance to do any more research on this. You guys did a great job on this, enjoyed the two film clips. Hope all. Is well with all this snow. I have to dig out of my house now. Stay warm and be safe. Great reading, lot of interesting info.